Big Storage allows you to add an extra disk with considerable storage capacity to your VPS. This is for example useful for data storage such as media files or back-ups. Follow the steps in this article to order Big Storage and use it on your Linux VPS. Should you already have a Big Storage disk, jump streight to configuring your Big Storage. This article applies to a Linux VPS. For Windows, check our article about Big Storage for your Windows VPS. Data transfer between your VPS and Big Storage does not count towards your VPS' monthly data traffic limit. In your control panel navigate to the tab 'BladeVPS'. 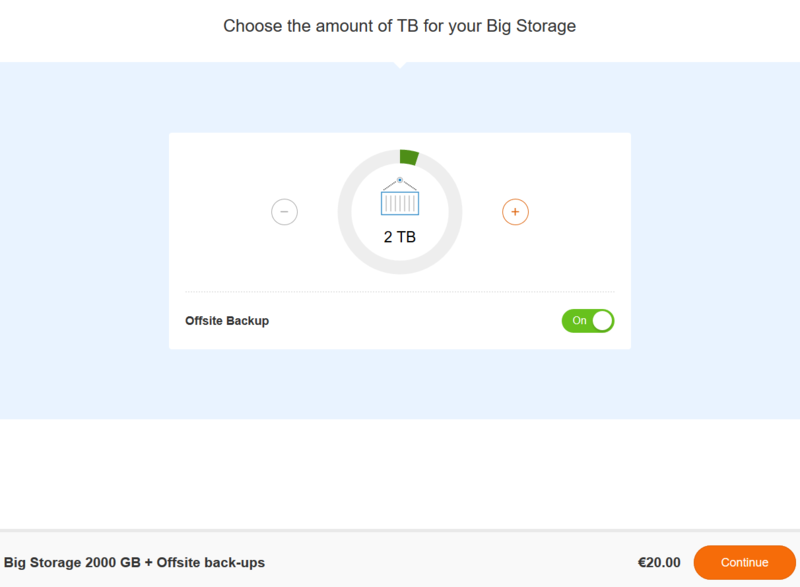 Scroll down to 'Order extras' and click 'Bestellen' behind 'Extra storage, up to 40TB'. Choose the size of the disk and whether or not you'd like to use off-site back-ups for your Big Storage disk. When you're finished, click 'Continue' and follow the remaining steps of the order process. Please note that it may take a little while before your Big Storage becomes visible in your account. After completing the order, you're returned to your VPS overview page. Beneath the VPS console a new section called 'Big Storage X TB' will be visible. You can manage your Big Storage by clicking the cog wheel behind it. After connecting the Big Storage disk, a new disk vdX has appeared. This is your Big Storage disk. Replace X by the letter of your Big Storage disk (b in this example) in the examples in the rest of this article. Please note: step 2-3 overwrite existing partitions and file systems on your Big Storage! Only perform these steps if the disk has been erased, or hasn't been partitioned yet. Proceed to step 4 if you do NOT want to overwrite existing partitions and file systems and connect an existing Big Storage to another server, or if your VPS has been reinstalled again. You can now create a file system. Below we're creating an XFS file system, but you're welcome to choose ext4 or btrfs should you prefer. These are out of the scope of this guide however. You're now finished with this guide and ready to start using your Big Storage! You're absolutely right, not sure how that slipped in. We'll be updating the article today. Thanks for your feedback!